In November, Idaho Forest Company (IFG) completed the purchase of Clearwater Paper’s mill in Lewiston, Idaho. The deal was valued at $30 million. IFG officials were working to have the mill operational by mid-December and employ about 120 workers — about half the amount employed by Clearwater Paper. IFG operates four mills in Idaho and was the nation’s seventh biggest lumber producer before the purchase. 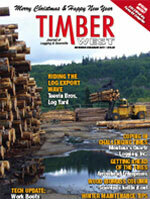 The Beck Group reported that two recent benchmarking studies illustrated the challenges faced by softwood sawmills operating in the coastal region of the Pacific Northwest. A surge in log demand from Asia has led to increased log costs and lower profitability relative to other regions of North America, according to The Beck Group, the firm conducting the studies. On average, study participants with coastal stud mills lost more than $10 per thousand board feet (MBM) of production, while stud mills in the Inland West of North America were more than $15 per MBM in the black. Southern pine mills achieved profits of slightly less than $10 per MBM. Top quartile producers fared much better than the average mills in both studies, outperforming them by more than $25 per MBF. However, there was a wide range of profitability among producers. The Beck Group says that the rising sawlog costs are the latest challenge facing the coastal mills that, along with the rest of the lumber industry, have been battered by weak lumber demand and historically low lumber prices since mid-2006. During the same time period, mill curtailments and closures in the U.S. Southeast and Inland West have led to decreased log demand and log price levels, allowing many mills to operate with modest profits in spite of the depressed lumber market. U.S. Forest Service Chief Tom Tidwell testified in November before Congress on the strengths and efficiencies of the agency’s draft new Planning Rule that, when finalized, will provide a framework for how all of the 193 million acres of national forests and grasslands will be managed in the future. “We need a planning rule that has less process and costs less, with the same or higher level of protections,” said Tidwell. In his testimony before the House Natural Resources Subcommittee on National Parks, Forests and Public Lands, Tidwell discussed how the new rule will decrease the costs of forest planning while delivering better protections for forests, wildlife, and water resources and supporting ecosystem services and multiple uses of the National Forest System. The new rule would update planning procedures for 155 national forests and 20 grasslands that have been in place since 1982. Tidwell noted that the new rule will greatly reduce the amount of time required by individual forests and grasslands to revise a plan, which will ultimately save time and money at the ground level. The proposed rule would direct plans to conserve and restore watersheds and habitats and would strengthen community engagement and collaboration during the development and implementation of individual plans. The Department of Natural Resources says Pacific Northwest log prices have held relatively steady in the first ten months of 2011. During that time, the price of a “typical” DNR log delivered to the mill has varied in a narrow range between $469/mbf and $503/mbf, with the price at $476/mbf in October and an average 2011 year-to-date price of $484/mbf. This is significantly better than the average annual composite DNR log prices for the last three years, at $409, $316, and $413/mbf respectively for 2008, 2009, and 2010. Regional log prices have held up in 2011 because of the increased level of log exports to China from private forestlands. West Coast lumber prices show a similar pattern to log prices, with the Random Lengths’ Coast Dry Random and Stud composite lumber price averaging $275/mbf through the first nine months of 2011, compared with $209, $190, and $264/mbf for 2008, 2009, and 2010 respectively. The composite lumber price was at $265/mbf in September, the most current data point. Pacific Northwest log exports to China are expected to revert to their recent high levels after the current slowdown, but if they don’t, DNR’s timber sale prices will likely fall below the levels projected in this Forecast. The DNR is keeping the projected timber sales levels unchanged at 679, 679, and 597 mmbf for FYs 2013, 2014, and 2015 respectively. Based on no changes to the projected timber sales levels and based on the results of DNR’s timber purchasers’ survey (on the timing of their harvesting of timber currently under sales contract), there are only minor changes to forecast timber removal volumes for FYs 2012-2015.